My Little Game Dev Developer Completed Games Stop the Bats! 'Stop the Bats!' is a game about stopping bats. It's based on the MLP (copyright Hasbro) episode 'Bats! ', and features fast-paced gameplay with all your favorite characters like Applejack and Flutterbat. The player starts with 10 trees and 50 apples. 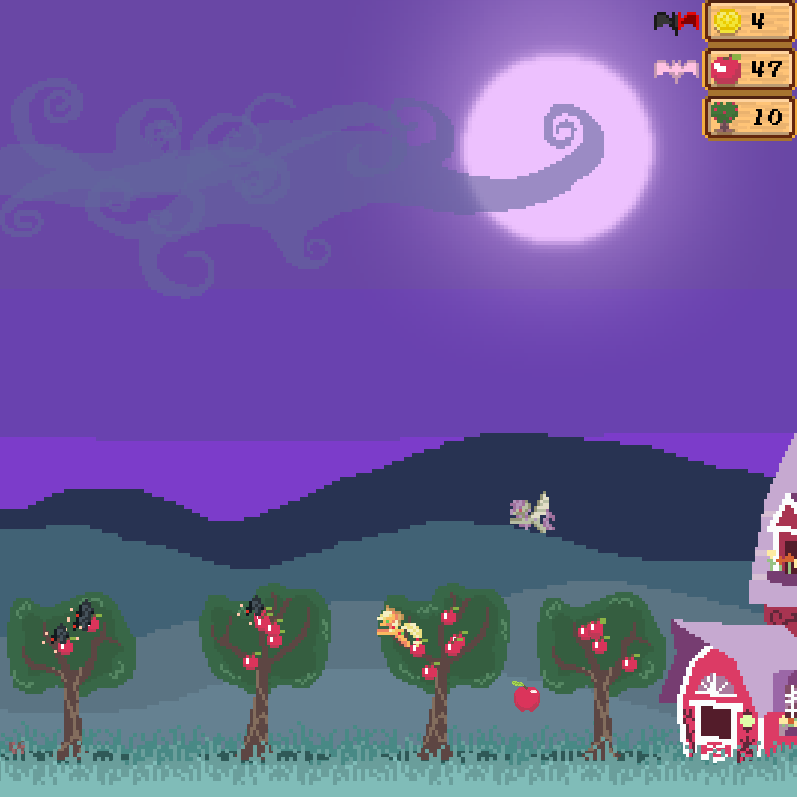 Vampire fruit bats will appear in waves from both sides of the map and attempt to eat the apples. Bats drop coins ('bits') when defeated. Use them to buy upgrades in the shop (or not), which can be opened/closed by pressing 'E' while standing on the barn door. Flutterbat also appears to harass the player by swooping down and stunning them for several seconds. If you kick her enough times, she will run away. Winning the game requires that you defeat all the bats with at least one living apple remaining. This always takes about 20 minutes. You lose if all of your apples are eaten, an unfortunate phenomenon that usually takes less than 20 minutes. I'd like to see what high scores (most surviving apples) people can get, so feel free to post yours if you beat the game. My best is 4 surviving apples, but I only played the final version once. All the art assets in the game were made by me in Paint.net. Many screenshots from the show were referenced, so they are not entirely original. The sound effects were created with the incredibly useful Bfxr (http://www.bfxr.net/). Stop the Bats! was created using C++ and SFML over the course of 8 days. In many places the code is rather horrifying, but it works. This is my first published game and it was only tested on three computers, all running Windows 7 or 8. I'm sorry to say that I have absolutely no idea if it will run on other platforms or video cards, although its SFML base should support all of the major OSs. The Apple Health upgrade is very important. Flutterbat doesn't like the Jump Height upgrade. Attacking is much more effective when you are moving at full speed. Don't stick to one tree, go back and forth over all of them. Press shift+alt+control+(number key) for extra fun. This is really great! Would be good if you could release a Linux build and/or the source.